We are a Burning Man theme camp bringing the swinging monkey culture of the Original Muscle Beach in Santa Monica, California to the playa. Swing City was founded by Robert Chapin & Jessica Cail in 2010. It gestated out of the community at the Original Muscle Beach (OMB) in Santa Monica California. The goal was to take the vibe, sharing culture and acrobatic fun we have on the beach, to Black Rock City. As Black Rock City (aka BRC) is a gift economy, we thought it would be a great way to gift what those of us love about the beach to the greater community on The Playa. 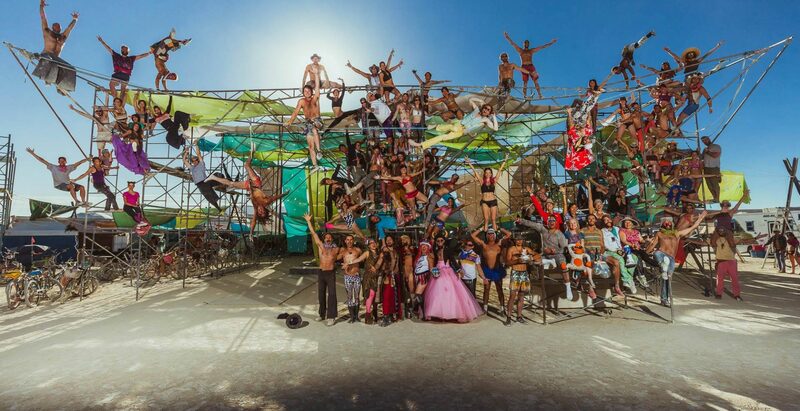 The goal has always been to create a sort of hanging city, where we can camp in the rig with hammocks, play in the rig with rings & aerial, etc., while getting comfort from the rig which provides shade from the intense sun at Black Rock City. Every year we evolve. Every year is an expansion of that vision. Many of the customs and ways in which the camp operates directly stem from our first year experience & the vision remains steady: to share our community and expand the fun!